If you look at paintings of lute players from the 15th century you see the right arm coming over the end of the lute and the fingers held nearly parallel with the strings. The strings are plucked by a plectrum which is moved up and down by movements of the arm and/or wrist. When lutenists first started to play with their fingers instead of a plectrum, they kept a similar hand and arm position and played scale passages with alternating thumb and first finger just as they used alternating up and down movements of the plectrum (see picture, right). This technique, called “thumb-inside” or “thumb-under”, continued to be used until the end of the 16th century,when (possibly motivated by the increasing number of strings on the lute) it began to be supplanted by a “thumb-out” technique. In “thumb-out”, the arm comes over the top of the lute, the fingers are held nearly at right angles to the strings, and the thumb is stretched out in front of the fingers. The little finger still rests on the soundboard, sometimes even behind the bridge so the strings are being plucked close to the bridge. 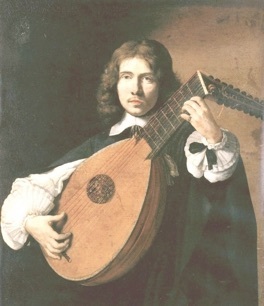 In the 20th century revival of the lute the evidence of “thumb-inside” technique was initially not taken seriously: most lutenists had been guitarists and played the lute with some modification of their guitar technique. Then in the 1970s some lutenists (notably Michael Schaeffer) started to develop a more historically-based technique. The improvements in sound and speed were revolutionary, and the shockwaves from that revolution are still with us: the “thumb-inside” technique is now the dominant technique even amongst players who specialize in later music! Now I think we are seeing the beginnings of the development of a proper “thumb-out” technique, again based on historical evidence. For the moment, it still seems appropriate for beginners on the lute to start with “thumb-inside”, unless they plan to be baroque lute specialists. Hence these notes, which take into account the fact that many beginning lutenists have experience of the classical guitar and usually find several aspects of this technique puzzling. In this technique the thumb does a lot of work, playing as often on treble strings as bass strings. This may seem odd to someone raised on the classical guitar, but it works well for the style of music in question. The thumb and middle finger play on strong beats, the index finger weak beats. Fast runs are always played with the thumb and first finger, even if that means the thumb having to move quickly down to the bass strings to play a bass note and quickly back up again to play a treble note. 1. The lute must be held quite high (a strap helps) with the neck only slightly angled up from the floor. 2. The neck should be angled slightly forward as though you are pointing it at someone who is standing to your left and a little in front of you: this helps avoid any unnecessary bending of the right wrist and tension in the arm. 3. The lute should be tilted slightly back (perhaps 2-3 degrees) so that the soundboard faces more towards the ceiling than the floor: this helps the right-hand thumb to operate properly and the sound of the instrument projects better too. 4. Using a footstool, as many do for the guitar, is usually not a good solution because the lute is round and slippery and you end up hunched over it – the same applies to crossing your legs. I am now convinced that the best way to hold the lute is to use a strap to keep it up and a piece of foam on your right leg to stop it slipping. The object is to have the instrument fixed reasonably firmly in place without the involvement of hands or arms. Using a strap it is possible to achieve this while sitting with your back upright and both feet flat on the floor. Many chairs are too high – ideally your thighs should be parallel to the floor. If you arrange yourself carefully, you can achieve a similar result by resting the edge of the lute against the edge of a table: this is historically well-documented, but do be careful to protect the edge of the lute from damage. 1. The last joint (nearest the tip) of all the fingers stays relaxed. 2. The thumb moves only from the main joint (almost back at the wrist): the thumb is a long, heavy thing – think of it falling towards the floor under its own weight rather than being pushed. 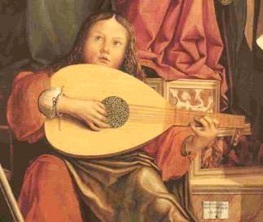 The basic thumb movement is towards the floor, which given that the lute is slightly angled back (see Holding the Lute, note 3) means that the thumb is moving through the string and towards the soundboard. In a rest stroke it comes to rest on the next course, and this is a good thing to practise. It is also what gives you a good blend of the octaves in the bass and is essential for all multi-course lutes (the thumb is always resting somewhere, giving stability to the hand and secure knowledge about where it is). 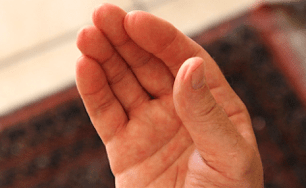 Not all thumb strokes are rest strokes, however, so in this case some slight modification is needed in order to miss the next course – but the basic movement is the same, relaxed and towards the floor, not an in-and-out movement. 3. It is important that there is a respectable angle between the thumb and the strings, otherwise you play too much with the edge of the thumb and get a thin sound – or worse, catch the nail if it’s too long. 4. When the hand is held in this way, the thumb moves towards the ring finger (if it touched it would be about halfway along) – so the thumb moves into the hand – hence “thumb-inside” or “thumb-under”. When playing runs with thumb and first finger, the thumb plucks a little closer to the bridge than the finger. 5. The hand must be rotated outwards (palm sufficiently angled towards the ceiling) that the fingers can pluck a course and follow through without touching the next course, all without bending sideways or lifting away from the soundboard, just by moving towards the palm of the hand. 6. The fingers move mostly from the middle joint (but opinions differ as to the proportion of movement which comes from the main joint and the middle joint). The fingers move towards the palm of the hand, as when closing your fist – make sure they’re not tempted to move sideways. Remember not to bend the last joint. 1. The hand position is relaxed – fingers slightly curved, thumb more or less straight, wrist straight. If you stand and allow your arm and hand to hang down loosely at your side, that is what your hand (and wrist) should be like when you bring it up to the lute. 2. The arm comes round the end of the lute so that the fingers are almost parallel with the strings, the wrist passing over the middle of the bridge. The angle between the forearm and the centreline of the lute will be about 25-30 degrees. The wrist stays straight and relaxed, more or less in line with the forearm in both dimensions, perhaps rotated very slightly towards the thumb side. The edge of the hand will be quite close to the strings, perhaps only a few mm. 3. The little finger rests lightly on the soundboard, not on its tip but on its side, most of the last joint being in contact with the soundboard. The angle between the little finger and the soundboard will be about 35-40 degrees. 4. The hand is rotated outwards so you can see into the palm, just enough so that the fingers can pluck (as described below) without hitting the next course. The angle between the thumb and the soundboard will be about 35-45 degrees. 5. As an average, the strings should be plucked just over the edge of the rose, i.e., not over the middle of the rose but slightly more towards the bridge. The actual position will depend on the size of the lute, the string tension, and several other variables. People with normal length arms and relatively small lutes (around 60cm string length) will find it impossible to fit the edge of the lute into the crook of their arm (because if they do their right hand ends up on the neck side of the rose!) and will find that the edge of the lute rests (uncomfortably) about halfway along their forearm: many people wear some kind of protective band on their arm for this reason. This problem is minimised by keeping this angle as shallow as possible (see Holding the Lute, note 2). 7. The area of contact with the strings is large. If you press your fingers onto the strings in playing position, the resulting indentations in your finger go right across the middle of the finger end (the same applies to the thumb – you are playing with the middle of it, not the edge). You are not scraping away on the top of the strings, but getting right in there with them! 8. It is important to play both strings of a course cleanly, equally, and simultaneously. Bass courses tuned in octaves make this easy to check – you should hear the two notes sound absolutely together. 9. In plucking the fingers displace the string slightly towards the soundboard, so the plane in which the strings vibrate is not parallel to the soundboard (which would give very little sound) but angled. In some ways this is analogous to the apoyando stroke of the guitarist. 10. A trap which is easy to fall into is “bouncing”: when playing runs with the thumb and first finger, moving the hand towards the soundboard and away from it with each stroke; or when playing chords, pulling the fingers away from the strings as the chord is plucked. Don’t do it! The knuckles should stay the same distance away from the soundboard all the time. 11. The middle finger is more difficult for some people than others. It’s difficult for me because, unlike most people, I have a long 3rd finger (only 6mm shorter than the middle finger) and a short index finger (about 12mm shorter than the middle finger). The tendency is to bend the middle finger, but we have said the last joint of all the fingers should be straight (and relaxed). For me, that means the middle finger plucks about 12-14mm further from the bridge than the index. In fact the index finger comes roughly midway between the middle finger and the thumb (well, actually slightly nearer the middle finger, my thumb is quite short). Oh, I’ve just noticed another interesting fact: in spite of its length, the ring finger plucks in exactly the same place as the index (it starts with more bend in the second joint), so reading from the bridge, you get thumb, then index and ring (and little finger on the soundboard, all at the same distance from the bridge), then middle finger. The angle between the middle finger and the strings is therefore slightly shallower than it is for the other two fingers. The really crucial point is that people’s hands do vary considerably, therefore different players look different even when their technique is very similar. The principles underlying the technique will be the same.